The Hall of Isaac including the entrance to the Garden of Eden is open for Jews 10 times a year. The Tomb of Machpela is the 2,000-year-old structure that covers the underground cave of the Patriarchs and Matriarchs. 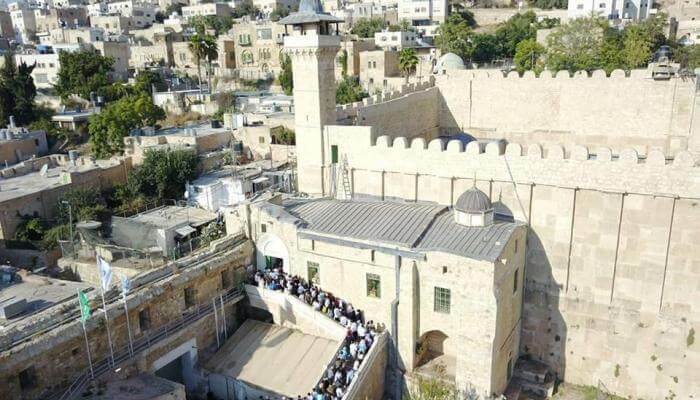 It contains both a synagogue area and a mosque area with each side being managed separately with separate entrances. For ten days a year, the Muslim area of the Tomb of the Patriarchs is open for Jewish prayer services and for another ten days, the Jewish area is open for Muslim prayer services. This gives each side free access to otherwise off-limits sections, although certain sections are off limits even during these special days. The outside courtyard and Seventh Step garden area is always open. On the following days the Tomb complex will be reserved for Muslim prayers, including those areas normally used for Jewish prayer services. All Jewish services will take place outside at the Seventh Step garden. Please note that there may be changes in opening and closing times. It is recommended that you double-check by calling 050-647-7776 or 050-647-7744. For any additional inquiry and for coordinating events and celebrations, the Cave of the Patriarchs staff is at your service.